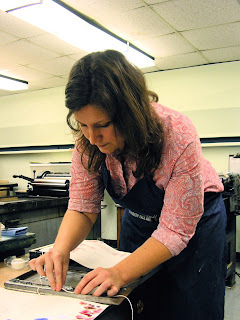 I met Lauren Faulkenberry a year ago while she was assisting Steve Miller's class at Penland School of Crafts. Not only is Lauren one of the nicest people you'll ever meet, but she is also an amazingly talented artist and writer. We share a mutual love of all things paper and book related. I hope you will enjoy reading her insightful thoughts about art, printmaking, and artist's books. For those of us that do not know, what is letterpress? 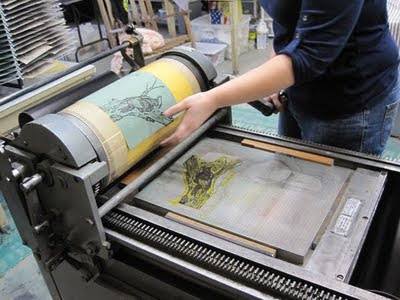 Letterpress basically refers to a certain kind of printmaking, which uses partially mechanized presses that have a bed that holds metal type, woodblocks, linoleum blocks, and other such things that are "type high". That "height" is the height of metal type, which was commonly used in these presses. The most popular of these presses are the Vandercook and the Chandler & Price--both of which were first introduced in the early 1900s. Paul Moxon maintains an excellent site devoted to info on the Vandercooks at www.vandercookpress.info. You are currently doing a "Kickstarter Project." Can you explain what Kickstarter.com is and tell us a little bit about the project you have proposed? Kickstarter is this amazing site that essentially allows people to invest in a creative project in its early stages. Artists propose a project, set a budget, and from there it's an all-or-nothing endeavor. If you reach your goal by the deadline, you get all of the money you raised, minus a small cut for Kickstarter and Amazon. If you do not reach your goal, no money changes hands. This is great because it doesn't force the artist to create something sub-par in order to fulfill obligations to a project that was not funded enough to allow the artist to create what she envisioned to the level of quality that full funding would allow. My project focuses on sites in the Southwest that were once in ruins and were then salvaged and restored in order to benefit the community. I was really moved when I visited a couple of these sites in the past--one example is the Jingu Tea Gardens in San Antonio. The site was once a limestone quarry, and when the company went out of business in the 1920s, there was this ugly gaping hole in the city. It sat there for years until the city hired a Japanese architect to transform the site into the incredible botanical garden that exists today. The whole story is quite poignant, but it's a beautify example of redemption and innovation. In short, I find stories like this to be a testament to the creative spirit, and a reminder of how we can evoke positive change in the world and add meaning to our own lives and those of others. My book, which will be an editioned artist's book, will focus on such sites and document what I learn and experience by visiting them. You can view Lauren's Kickstarter Project here: Not Just Another Roadside Attraction: A Letterpress Book. Check out the awesome perks you can get by supporting her project! What makes a book an artist's book? This is widely argued, and my definition is fairly broad. For me, it's any book that is intensely personal to the maker--it's handmade, not mass-produced, and comes from the heart. It's not edited by someone who's concerned about its marketability. It exists like any piece of art does, and records a personal experience or reaction. I'm often inspired by nature, but I'm fascinated by people--they way we behave, the way we treat each other, the bizarre things we do. Combine that with my love of archaeology and mythology, and the obsession with patterns in behavior over time, and I've got an endless well. As a writer, I've always been drawn to unusual metaphor, so my most recent work has compared human behavior to certain bird behaviors--as compared to romantic encounters, of course! Someone just asked me where I'd like to be in ten years. I said "lying on a beach working on my next best-seller." I'd love to just make books all day--write novels, write stories, make artist's books, and be smeared in ink all the time. I'd love to be able to support myself by doing what I love. I try not to classify things as "bad" art. There is certainly art out there that leaves me cold, that I do not find insightful or inspiring. And there are definitely varying levels of craft, and effort, construction and insight. The art that I remember most is timeless. It's moving to the viewer, and it's insightful, and it's meaningful. It surprises me, and leaves me thinking and wondering about it. It makes me see something about the world in a new light. It stays with me long after I've seen it. This book called "The Heart Wants What it Wants" is probably my favorite. It was a real challenge to make the materials (and the presses!) do what I wanted, but the book is a series of three 18 x 24 woodcuts that fold down to a 6 x 6 size. It incorporates the myth surrounding the Greek Furies, and it incorporates excerpts from a short story I wrote. It's about some of my favorite obsessions--love, heartache, loss, and redemption--and is a wild little book that looks fairly tame on the outside. 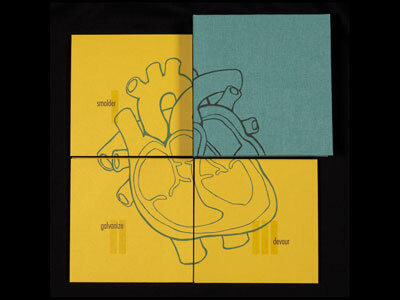 "The Heart Wants What it Wants" (set of three books and clamshell case). Letterpress printed with reduction woodcuts and photopolymer plates, with volumes titled Smolder, Galvanize, and Devour. With a structure similar to a map fold, each book is printed on a single 18" x 24" sheet that collapses to 6" x 6". There are so many! Mary Ann Sampson, the book artist--she makes incredible artist's books and sculptural books. Gaylord Schanelic does amazing wood engravings. Douglas Dowd is a fantastic printmaker that has this bold graphic style that I love. Julie Orringer is one of my favorite writers--she's funny and poignant and brilliant all at the same time. Same goes for Nanci Kincaid . I love Neil Gaiman for his wild stories--I'd have to say the same for Alan Ball and JJ Abrams. Also Audrey Niffenegger , who was a book artist before she was a best-selling author. If I could get them all to come to a dinner party, along with Hugh Jackman, I would be deliriously happy. Okay, I'll show my hand. I can't stop listening to Amy Winehouse . I have a real weakness for Al Green . I can't stop watching True Blood and the Glades . Wonderfalls is my most favorite show of all time. I just went to New Orleans and saw the world's only voodoo museum--I've always been fascinated by voodoo and Marie Leaveau, and now I can't stop thinking about it. I even bought some gris-gris and put it under my bed. And then I got inspired by this idea of scandalous women in history and started a blog called "No Wallflowers Allowed." I've got a deep love of cowboy boots. I collect prints from my friends and artists I admire.